(Nanowerk News) Who says science isn’t fun? In their daily work, experienced microscopists at JEOL USA Inc. in Peabody, Massachusetts look at every kind of sample imaginable – paper, neurons in the brain, ceramics, semiconductors, insects, and forensic evidence, to name just a few – through the state-of-the-art scanning electron microscopes (SEMs) that the company manufactures and sells. No matter how long they have been doing this type of work, they are often amazed by the details and the interesting things they observe magnified at hundreds of thousands of times. 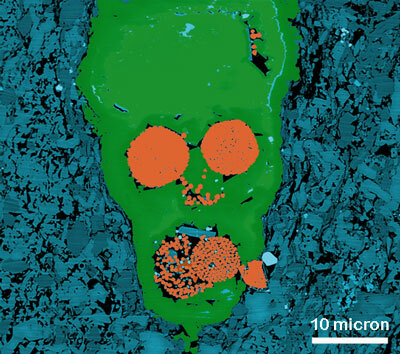 This week, during a SEM training session for an existing energy-related customer, JEOL specialists Dr. Natasha Erdman and Tony Laudate were examining the sample of oil shale in the microscope when they came upon this startling image that resembles a skeletal face and looked somewhat familiar to them. “It’s our version of ‘The Scream’ by E. Munch, said Mr. Laudate. Naturally they knew that what they were really looking at was an ion-beam polished cross section of quartz (the skull), pyrite (the eyes, nose, and mouth) and kerogen (the dark patches that are organic material). But the image was saved and will definitely be one of the most unusual that JEOL has ever taken. SEM micrograph of a cross section of shale closely resembles “The Scream” by E. Munch. (False-colored backscatter electron image taken on JEOL JSM-7600F SEM. Sample prepared with JEOL Cross Section Polisher. The clear details shown in the picture (micrograph) from the SEM is due to not only the optics of the microscope, but the way in which the sample was prepared and precisely cross sectioned from a larger chunk of shale through the use of a special ion-beam cross section polisher. This tool has become indispensable for oil shale analysis. One of today’s hottest areas of potential under-utilized energy resources is shale. Abundant in specific regions of the United States, oil shale is a fine-grained, sedimentary rock composed of flakes of clay minerals and tiny fragments of other minerals, especially quartz and calcite. Shale also has a complex network of soft veins of an organic substance, kerogen and accessory opaque minerals such as pyrite. When heated, kerogen can release hydrocarbons, or fossil fuel. By studying the internal composition of the shale and the network of kerogen filled veins, scientists can determine the abundance and ease of extraction of oil. Companies investigating this alternative source of energy have turned to JEOL for not only the electron microscope, but a unique sample preparation tool that creates pristine cross sections of oil shale. Without this tool, it is difficult to prepare cross sections of shale without distorting and smearing the soft veins of kerogen trapped in the composite. The JEOL cross section polisher slices and polished the sliver of shale with an argon beam to yield undistorted, precise cross sections. Every detail can be clearly seen, allowing researchers to clearly see the network of veins of kerogen in the sample, and can take the imaging a step further to make 3D reconstructions of the pore network by using a Serial Slicing and Sampling technique with the Multibeam focused ion beam (FIB) instrument.